Locality: United States, Colorado, Rio Blanco, ¼ mile W of Puckett Gulch and 1¼ miles N of Hay Gulch. Habitat: On shale of SE-facing slope with Artemisia, Pinus and Juniperus. Notes: Stanleya pinnata (Pursh) Britton var. integrifolia (C. James) Rollins, det. J. Hall, July 1997. 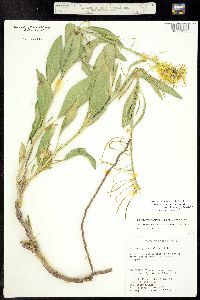 / Stanleya pinnata (Pursh) Britt. var. pinnata f. integrifolia, det. B.L. Turner, 2001. Originally ID as Stanleya pinnata. Corolla yellow. USGS Segar Mountain.